Nikos Kazantzakis - Νίκος Καζαντζάκης Lived February 18, 1883 – October 26, 1957 was a Cretan writer and philosopher, celebrated for his novel Zorba the Greek, considered his magnum opus. He became known globally after the 1964 release of the Michael Cacoyannis film Zorba the Greek, based on the novel. The presence of Kazantzakis is everywhere in Crete yet he did not spend much of his adult life there, after becoming a Francophile. The great writer, and a pious Greek leaned towards socialism and was an admirer of Stalin. True to form he wrote the book: "The Last Temptation of Christ". The Greek Orthodox church, not appreciative of his politics and to them his absurd Christian views, excomunicated him and ruled that he could not be buried in a cemetery. As a result he lies in the wall surrounding the city of Heraklion near the Chania Gate. There his epitaph reads Δεν ελπίζω τίποτα. Δε φοβούμαι τίποτα. Είμαι λεύτερος. "I hope for nothing. I fear nothing. I am free." Today, much of the spirit of a true Cretan is enshrined in those words. 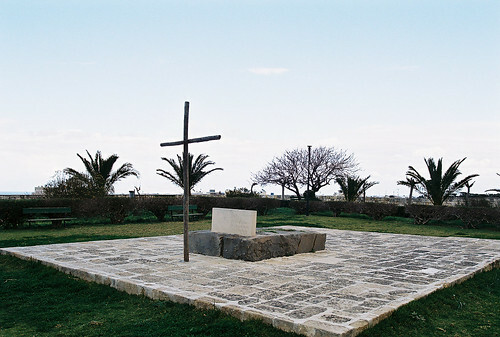 The epitaph is often seen in French as a Francophone tribute to Kazantzakis. He loved France (french culture was very much in vogue in Greece at the time) . He adopted France as another home. One of the great ironies of the life of Nikos Kazantzakis is that he nearly won the Nobel prize for literature in 1957. He was separated from that great reward by just one vote. he lost to Albert Camus who later said that the Cretan deserved to win! The Nikos Kazantzakis name lives on in Heraklion's International Airport named after him. And, until the 2011 regional re-organisation and reform of local government so was a municipality called Nikos Kazantzakis in Central Crete. Now it is part of the larger municipality known as Archanes - Asterousia. What has not changed is that Peza, the seat of the previous municipality is still one of the best wine growing areas of Crete. The 50th anniversary of the death of Nikos Kazantzakis was commemorated with Greece minting the €10 Nikos Kazantzakis coin in 2007. His image is shown in the obverse of the coin, while on the reverse depicts the Greek National Emblem and Kazantzakis' signature. As an "a propos", unique to Crete, the Ottoman's named Greek families with a distinctive ending for their family name, as in "akis". The English equivalent is son of, belongs to. Only the descendants of Cretan families from the days of the Ottoman Empire carry such name endings. Modern Greeks know a true Cretan by this fact. While today it carries a unique distinction to the Cretans themselves from the rest of Greece, it was despised in earlier eras. "Δεν ελπίζω τίποτα. Δε φοβούμαι τίποτα. Είμαι λεύτερος." Fr: "Je n'espère rien. Je n'ai peur de rien. Je suis libre"
En: "I hope for nothing. I fear nothing. I am free."